Ortega Highway, traffic will be reduced to one lane between Avenida Siega and Antonio Parkway from 6:30 a.m. to 12:30 p.m. The Eastbound Ortega Highway from Antonio Parkway to El Cariso Village will be closed from 06:30 to 12:30. 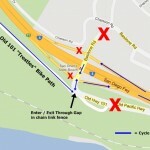 Not mentioned from the Register is that there was/is signage through Doheny Beach and Campground as well as the protected bike lane from Beach to Capistrano indicating that that they also will be closed until 16:00. 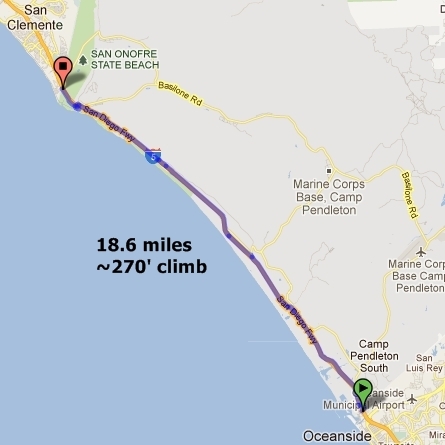 If you’re trying to get some miles in for the OC Gran Fondo, ride elsewhere, or take PCH straight through Dana Point and into San Clemente. Marguerite to Avery to Camino Capistrano to Del Obispo will get you there from the inland county, or you could take Marguerite all the way to Ortega to work your way through traffic to Del Obispo. If you go out on PCH the problem will be on the return if the protected area is still closed because your access to Harbor is cutoff unless you take the sidewalk from Palisades / Beach, or ride the on ramp (watch for traffic coming from the right at the gore point) back onto PCH. 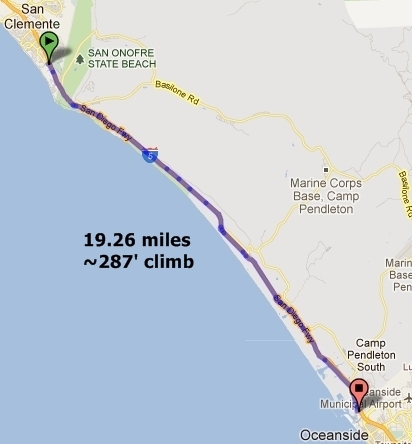 Or, you could have a real workout and take a left at the dreaded Stonehill and take it through the rollies to Niguel, or take the easy way by turning left on Del Obispo (which turns into Harbor after crossing PCH) so you have the option of climbing PCH, Golden Lantern, or for extra bonus points, Cove. ..so maybe we’re getting worked up over nothing because we didn’t get the memo. Plan your routes carefully – it looks like a warm weekend and all the popular and safe southern routes are out of play this Sunday. Saturday be aware of car parking and extra traffic at Trestles for the Surfing Championship. Finally, the injured rider from last Thursday the 13th was registered to be in Sunday’s Tri, We’ve asked that her entrance fee be refunded from the promoter. We’ll let you know his response when we receive it. 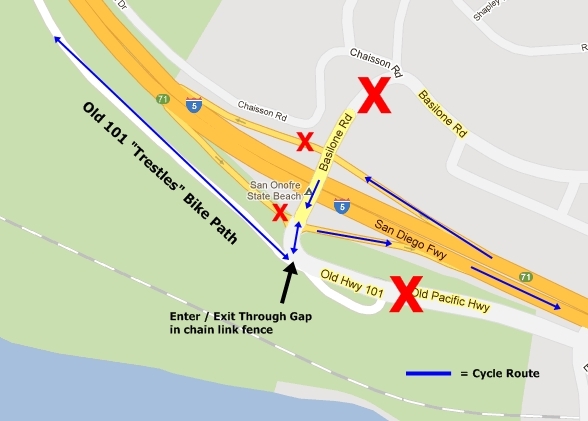 The bike path along Old Highway 101 will be closed from Las Pulgas Road to the fence line at the southern boundary of San Onofre State Beach during daylight hours this Monday (6th) through Wednesday(the 8th) and again Tuesday, Aug. 14 through Thursday, Aug. 16. The campground will be ride-able to the fence line. Riders heading further south should detour at Basilone. 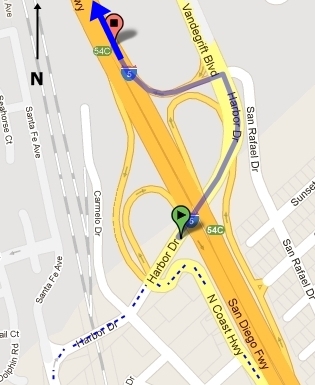 The detour will require traveling on the shoulder of Interstate 5 from Basilone Road to Harbor Drive. Be aware of rumble strips carefully hidden in the pavement. If there is an obstruction such as a vehicle on the shoulder, try and pass it on the right if possible. Passing on the left is dangerous and you could loose control crossing the rumble strips twice. Worst case, you may have to walk you bike off of the shoulder around the vehicle on the right. Oh, and there are snakes also! As scary as this may sound, it is actually a pleasant ride (except for the noise). The shoulders are wide and given that you will be riding the off and on ramps, you won’t really be on the freeway proper for too many miles. Don’t be surprised if you receive encouragement from motorists as they pass by. In fact, if traffic is backed up, you will be going faster them them! Caltrans will open the shoulders along I-5 from Las Pulgas Road to Basilone Road to bicycles in order to provide an alternate route for bicyclists during the closures. Caltrans will place detour signs and signs advising bicyclists that they must exit at all off-ramps, weigh stations and vista points along the route to avoid the possibility of conflict with vehicle traffic. Once the bike path has reopened, the signs allowing bicycles along this stretch of freeway will be removed. Continue on 5-N from Harbor in Oceanside and use every off ramp through the rest area, Las Pulgas, and the inspection station (another rest area if you need it) to exit at Basilone to continue on the Pacific Route North into San Clemente. 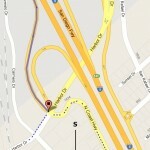 Exiting at Basilone, turn LEFT and cross over the freeway. The road will bend to the left and you will see a chain link fence with the bike path behind it on your right. Enter through the break in the fence, and continue north on the bike path which will “T” into Cristianitos road. Enter 5-S at Basilone and use every off ramp, at the weigh station, at the viewing area, at Las Pulgas, and at the rest area until you exit on Harbor Drive into Oceanside. Beware of a “tire-catcher” storm grate which lies just to the right of the fog line on the off-ramp on Harbor Dr. There is room to safely pass it on the right if there’s not too much debris. At the traffic light, a right turn will take you into the harbor, while going straight will put you onto the Pacific Coast Highway southward. Have a safe and uneventful ride, and tailwinds on your journey. 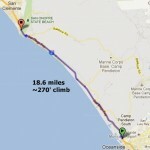 Camp Pendleton will be closed to cyclists 8/4/12, from 6am to 1pm (1300). 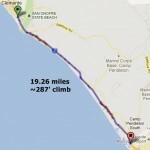 The bikepath from Las Pulgas to San Onofre Campground will remain open. Thank you Mr. Brine, we looked but must have missed the mention of the new striped bike lane in the documents on the CDM Entry CAP ( Citizens Advisory Panel) page. Thank you again for the clarification. The Corona del Mar Business Improvement District, calls for eliminating a traffic lane and nine street parking spaces on Coast Highway to create space for more landscaping and widened sidewalks, and to that end are paying for a feasibility study beginning this week. The study will run sometime (unknown as yet) into the early fall, so all cyclists take note. According to Tara Finnigan, city spokeswoman, details include eliminating one southbound traffic lane on Coast Highway through the intersection of MacArthur Boulevard and studying how the traffic flow is affected. “There will be a transition in the southbound direction from three lanes at Avocado Avenue to two lanes at Begonia Avenue,” Finnigan said in a released statement. The description of the project and additional details are here. Our email to the city seeking clarification for cyclists traveling through the area has not been returned. Our advice is to bypass the area using our suggested bypass route until things settle down, or we get clarification from the city. Hopefully you won’t wind up like this by riding Bayside, but you never know. With one southbound lane removed, more motorists might divert to Bayside and not be as kind as the motorists that are aware of the sharrows painted on the roadway. 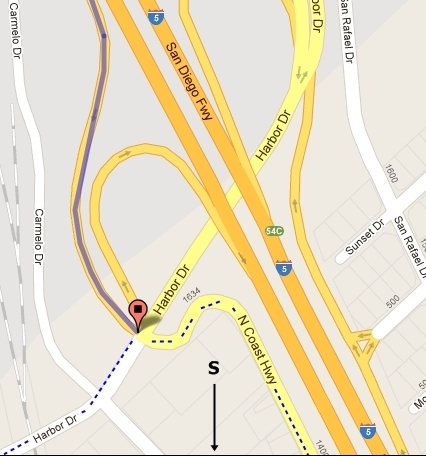 If you are a southbound cyclist up for a challenge, turn left at Bayside, run the back bay to San Joaquin, and take that to Newport Coast, right back to PCH. You’ll get a tough workout and avoid all the madness below. 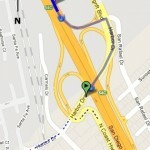 Northbound riders may also follow our bypass route here. Thanks for a “heads up” from the NPB/CDM patch.